Dorchester, Mass. — The campaign to rehire and win justice for four Boston school-bus drivers, illegally fired by the notorious union-busting Veolia Corp., got a big shot in the arm on March 5. After only only ten minutes of deliberation, a jury voted unanimously to acquit union leader Steve Kirschbaum of all charges brought by the Commonwealth of Massachusetts. The frame-up charges were brought after a June 30, 2014, rally of hundreds of school bus drivers was held to demand the rehiring of the four. The action ended with an indoor rally in the drivers’ break room. Veolia managers provided false statements to the Commonwealth to make it look like they had been attacked by Kirschbaum and that the premises had been violently entered. The charges, while totally made up, were serious. They initially included three felonies: breaking and entering to commit a felony; malicious destruction of property; assault and battery with a dangerous weapon; and trespassing. The courtroom victory was the result of an eight-month people’s mobilization that included six pack-the-court rallies; national call-in days to both the district attorney and the mayor; and weekly bus yard rallies organized by the local. People’s lawyers Barry Wilson and John Pavlos skillfully and passionately tore the frame-up apart and successfully turned the tables on Veolia and the political establishment, putting the union busters on trial. School bus drivers and community supporters of the union packed the court for three days, transforming the inside of the courthouse into a de facto union hall. During lunch breaks, the drivers held militant picket lines outside the building with placards saying “Drop the Charges” and “No Contract, No Work”! Dorchester District Courthouse truly became the gathering place for the political movement, as Brock Satter, with the Mass Mobilization Against Police Violence; Sandra Macintosh, of the Coalition for Equal Quality Education; Chuck Turner, former city councilmember; Herculano Fecteau, with the Boston Teachers Union; Tony Van Der Meer, of the Africana Studies Department at UMass; and Moonanum James, co-leader of the United American Indians of New England all showed up to support the union. The verdict was not just a victory for this political, social union — which fights for its members and also marches with the Black Lives Matter movement; resolutely defends lesbian, gay, bisexual, transgender and queer rights; and stands with Palestine — but a victory for the movement as well. What happened in court was a defeat for the union busters, a setback for Boston’s 1% and a blow to the city’s entrenched racist forces, who want to resegregate public education. From the moment the four bogus charges were filed against Kirschbaum in July 2014, it was clear that they were part of the union-busting campaign being waged against the local – a campaign exemplified by the November 2013 firing of Kirschbaum and the three other union leaders. The evidence was so obviously manufactured that in October the judge dismissed the first two charges. On March 5, a working class jury of six—including two union members — took almost no time to put the remaining two charges to rest with a “not-guilty” verdict. In fact, it was Veolia and its co-conspirators in the city administration who were put on trial. 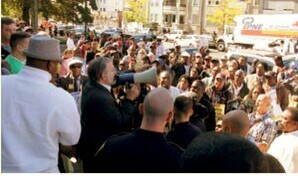 Witness testimony and Kirschbaum’s legal team showed that the events in question and the illegal firings that prompted the June 30 rally had everything to do with the fact that the contract was expiring that day at midnight — and that, in violation of the contract, Veolia had attempted to prevent the union from holding a meeting. The not-guilty verdict — which has so thoroughly discredited the version of events put forward by Veolia managers — can only help the campaign to rehire the four. Those in the Boston establishment who were holding their breath over this trial and hoping to see one of the union’s leaders convicted are now facing a renewed, re-energized, fighting, militant union that is not afraid to take things to the next level. Those who know this local also know that its members intend to fight, not only to rehire the four, but also to deepen the Black Lives Matter movement and the struggle against racism; to stop the school closings announced by Mayor Walsh; to defend public school transportation by keeping middle school students off the subway and on school buses; and to defend the righteous I-93 protesters and their First Amendment rights.